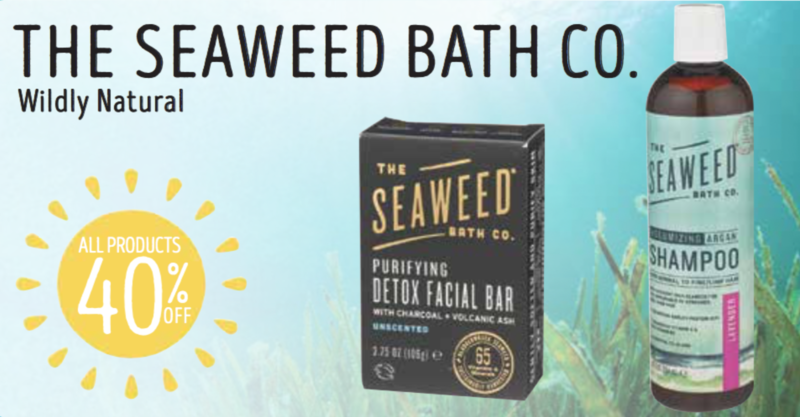 The Seaweed Bath Company has Something Great for You! Yup, it all started when Adam, the founder of the Seaweed Bath Company, noticed that his dry and irritable skin felt better the more he was in the ocean. He had tried a lot of products, but he didn’t like their harsh chemicals or side effects. He was living in Florida and that ocean water just seemed to help. So he began researching what healing secrets the ocean might hold. His search led him to ocean-based therapies and found that some spas were using seaweed in their skin care. He discovered thallosotherapy — therapy using sea water and shore products for skin care. He learned that a particular kind of seaweed — bladderwrack — was particularly beneficial. He got a big bag or bladderwrack from a spa in Ireland, where it grows in the cool waters, and started experimenting. 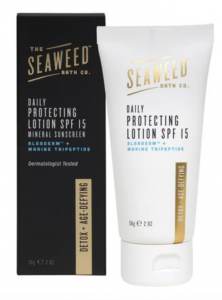 He developed some topical therapies with the seaweed, and found that soaking in a seaweed bath soothed any skin irritation, redness, or inflammation. Bladderwrack grows in a harsh environment, so it develops a strong mineral and protective oil profile, including iodine. Adam learned that Bladderwrack grows in the waters off Portland, Maine, and the seaweed is the most nutrient dense in May and June. He found a fisherman, Tom, who was harvesting the seaweed by hand for his own business. Adam started working with Tom, and their partnership was born. Adam thought this could be helpful for other people, so he started passing out samples of his seaweed bath powders. People found it very soothing and healing, and kept asking where they could get more! So in late 2010 the Seaweed Bath Company was born. When the tide is low, the seaweed is harvested by hand. They cut it at an angle at the base so that the plants will regrow in a healthy manner. It will grow to full size within 36 months. Adam makes sure that they are harvesting in a responsible manner, preserving the coastal environment. They rotate their harvest area between Cape Elizabeth and Casco Bay. They also do water and plant testing to make sure the seaweed is healthy and free of contaminants. After harvesting, the seaweed is dried in nearby Scarborough, Maine, to about a 10% water retention rate. 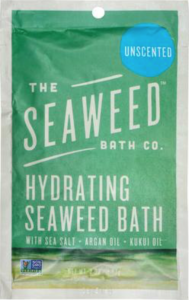 Then the seaweed is milled or powdered, as well as prepared for extraction, since the Seaweed Bath Company’s products uses all three kinds of preparations. The first products that Adam, and his wife Allison, developed were the detox bath and the bath powders. Later, as people asked for other items, they added creams, washes, and hair care products. Their main focus is hydrating the skin and hair, since hydration is so healing. They add quality ingredients like Kukui oil, Argon oil, Vitamin E oil, chlorophyll, neem, spirulina, and others. Their products are gluten free, and you’ll notice the thick moisturizing viscosity of their creams and hair products. I love the hair condition to tame my mane! Lassen’s is proud to carry products from the Seaweed Bath Company, and you can find something that you’ll love for your skin and hair! Catch the 40% on the entire line during our April 2018 monthly deal! It never fails that nature provides amazing solutions when we go out there and search for them! And that’s just what Adam did. There’s a Big Difference in Aloe Vera Products! The facts show Aloe Vera is among the top sellers of Super Foods & Herbs since 2009. Why? Because it works as a catalyst to improve absorption of daily foods and any supplements you may be taking to Super Charge your energy and your life! Aloe vera’s use can be traced back 6,000 years to early Egypt, where the plant was depicted on stone carvings. Known as the “plant of immortality,” aloe was presented as a funeral gift to pharaohs. 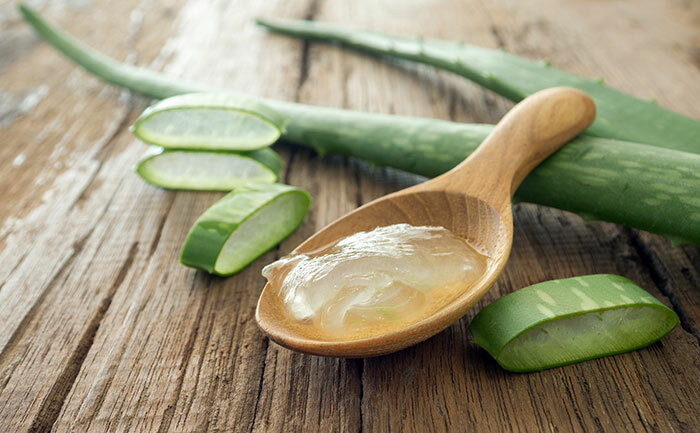 Historically, aloe vera has been used for a variety of purposes, including treatment of wounds, hair loss, and hemorrhoids; it has also been used as a laxative. Two substances from aloe vera, the clear gel and the yellow latex, are used in health products today. Aloe gel is primarily used topically (applied to the skin) as a remedy for skin conditions such as burns, frostbite, psoriasis, and cold sores, but it may also be taken orally (by mouth) for conditions including osteoarthritis, bowel diseases, and fever. Aloe latex is taken orally, usually for constipation. Aloe Life requires 25 lbs. of ORGANIC Whole Leaf Aloe Vera Leaves (CONCENTRATED) to produce every Quart which also includes the important YELLOW SAP the ancients wrote about thousands of years ago. This one-of-a-kind Aloe is processed with care to not over-heat, over filter or dilutes the important PLANT ACTIVES (over 100). 3rd party testing shows Aloe Life contains the highest solids and actives of any other product line with Polysaccharides in the range of 80,000 – 400,000 Dalton required for Optimum Body Wellness during cold season and throughout the entire year. Many people living with reduced immunity take 3-4 oz. of Aloe Life juices or tablets and are very happy with the results. Daily maintenance and Auto-Immune support is just the 1 – 2 oz. or daily suggested amounts for wellness. Anthraquinones are found in the bitter yellow sap and support Daily Regularity, Immunity and contains five natural Anti-Inflammatory agents responsible for pain relief and soothing skin for First Aid. Great with Allergies too! Also, Saponins are potent infection fighters both topically and internally for extra immune support factors. Growth factors called Gibberellins are supportive for new skin renewal and collagen repair. The Special Nutrition and Phytonutrients together support all the pathways of the body for hundreds of applications for wellness. Topical Skin Gel – Ultimate Skin Treatment is effective for sunburns and burns of every kind besides the only product to be successful in a Diabetic Wound Study in 1997, for every ulcer stage I – IV. Troubled skin from head to toe, athletes, chefs, gardeners, adventurists and even brushing one’s teeth plus scalp and hair makes Skin Gel the most versatile sought after product worldwide. Aloe Mist Spray gives a fast First Aid application, and very refreshing for a morning beauty regimen as an astringent followed by your favorite lotion perhaps Aloe Life’s famous Face & Body Lotion made for sensitive and troubled skin. Face & Body Lotion is a favorite and the natural ingredients; Macadamia Nut Oil, Jojoba Oil and Safflower Oil (high in Vitamin E), Chamomile Extract with Vitamin A, C and E plus Lanolin in a base of Whole Leaf Aloe Vera, not water. This allows for less application and better absorption of the oils and nutrients deeper into the skin for moisturizing. Less application on the whole body and will not plug pores as with waxes. No heavy fragrance only a very pleasant natural Grapefruit scent both men and women enjoy. Personal Gel Moisturizer is also a favorite for healthy lubricating and a gentle gel for sensitive skin. Supports dry and chaffing skin to include; underarms, body chaffing, post-delivery, sensitive head and scalp dryness, baby cradle cap and post-menopausal dry skin. Feels like silk on the skin and sexually active adults love the gentle inner gel Aloe Vera (less astringent than Skin Gel), Calendula extract, and Vitamin A, E and the mineral Zinc renewal aspects. Body Heat Athletic & Sports Lotion works fast to soothe and support sore muscles, joints, and injury. A favorite with seniors, athletes and older children that desire relief from outdoors or just daily life’s tensions including; sports, muscle strain, chronic injury and more. The safe ingredients of Whole Leaf Aloe Vera juice base, MSM ( a sulfur compound), Menthol, Arnica, White Nettle and Horse Chestnut with just the right amount of natural Vanilla scent is a very effective product sold since 1991. THE BEST ORGANIC ALOE VERA PRODUCTS FOR OVER 25 YEARS! 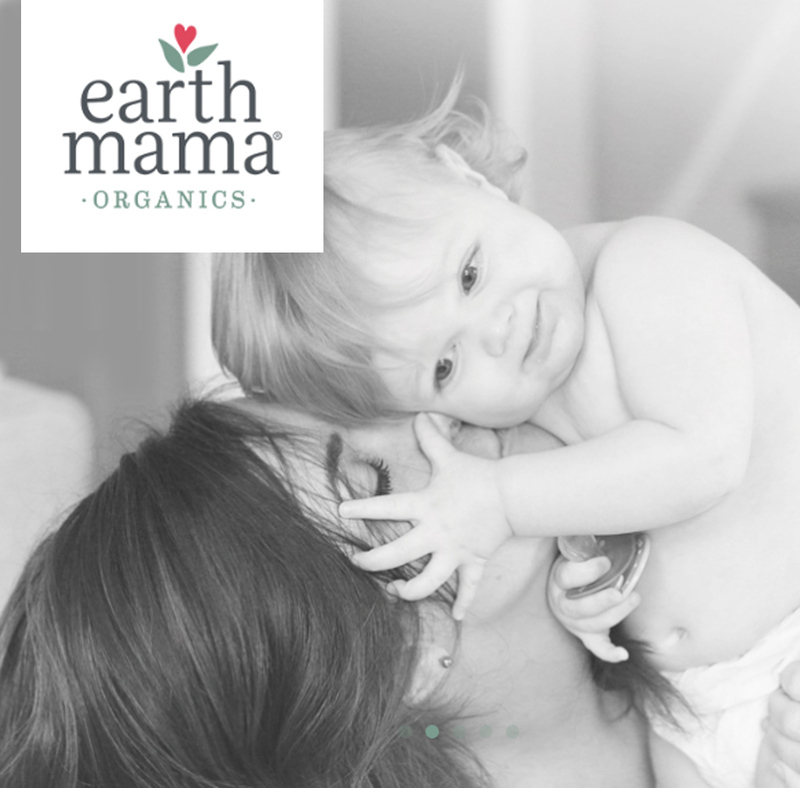 Earth Mama® Makes effective, natural herbal care for the whole journey of motherhood: pregnancy, postpartum, breastfeeding, baby care. Combines generations of women’s wisdom with traditional plant medicine to formulate certified organic herbal tea, soaps, balms, lotions, soothing sprays, and the first Non-GMO Project Verified nursing cream. Effectively supports the miraculous wonders and common indignities of motherhood. Trusted by doctors, midwives, neonatal intensive care units, lactation consultants and mamas worldwide. Safely nurturing mamas this way since 2002! consultants and mamas worldwide, we’ve been safely nurturing mamas this way since 2002! Mama is not just a marketing logo. She’s Melinda Olson, a nurse, herbalist, and real mother who believes mamas, babies and families have a right to safe, herbal, zero toxin products. Melinda began formulating organic herbal remedies for friends in her Oregon kitchen many years ago. Her love of organic gardening, passion for herbs and desire to find safe products for mamas and babies led to founding Earth Mama, an industry leader in safe, natural and organic herbal products. Melinda is an expert in the benefits of plant medicine, and continually balances her trust and care of traditional herb wisdom with evidence-based research. Earth Mama believes in the natural process of birth, and the healing power of nature. Their mission is to provide safe, herbal alternatives for pregnant, postpartum and breastfeeding women, and babies of all ages, and to help educate people about traditional plant medicine and safe personal care. They manufacture natural and organic products that work. If it doesn't measure up to Mama's standards, it doesn't leave the building. Pinkie promise! She’s One of Our Great Team Members! Megan is our Regional Lifestyles and Gift Buyer. She especially watches out for unique and exciting gift items. She is also the model for our Beads of Hope necklaces! Megan grew up in Northern California and got a degree in Geography with an emphasis in City Planning. She even speaks Polish! She spent 18 months in Poland during her college years. Megan really loves to eat healthy and she is also a runner. 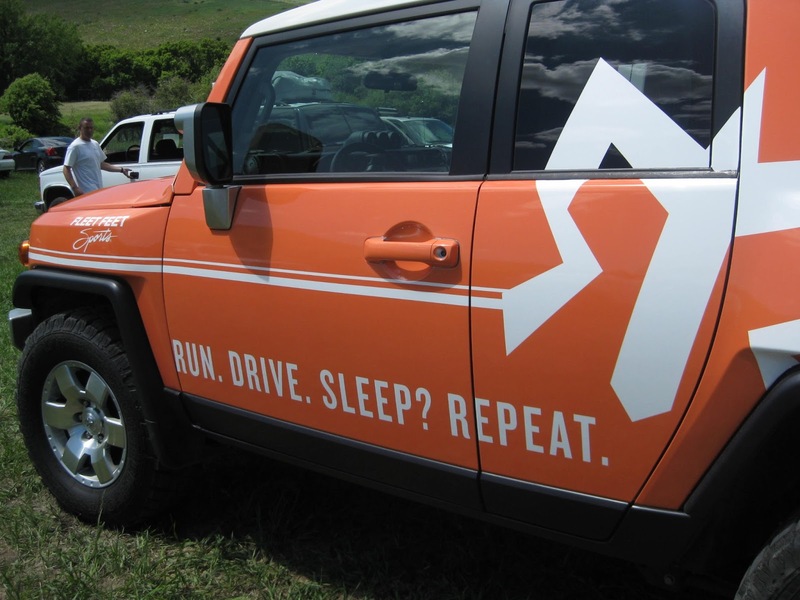 She has run the Ragnar Relay and some half-marathons, too. She loves to work in her garden and is devoted to clean and green living. 1. Because she was raised in Northern California, she is very partial to Redwood trees and foggy beaches. 2. Not only does she run for exercise, but for stress relief and meditation. 3. If she had to listen to the same musician over and over again for the rest of her life it would be Cat Stevens. 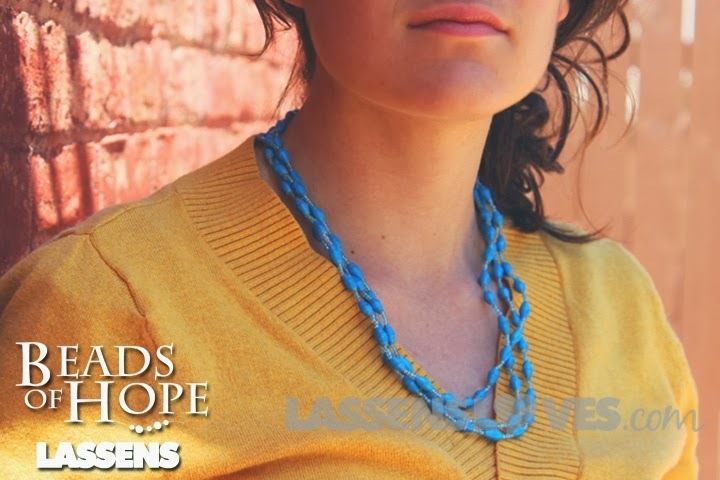 Megan’s favorite part of her job is learning about the different products that Lassens carries and meeting with companies that are passionate about their products, as well as passionate about improving our world. 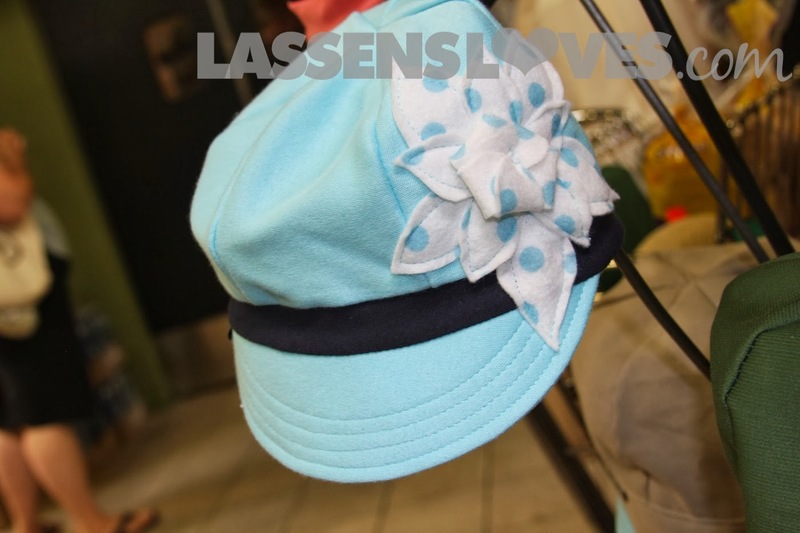 When I asked Megan about some of her favorite products she mentioned these adorable Flipside hats. Flipside is a family owned and operated business, the hats are made in the USA (California and Oregon), and they are made with repurposed and/or recycled materials. They use all of the organic materials that they can. 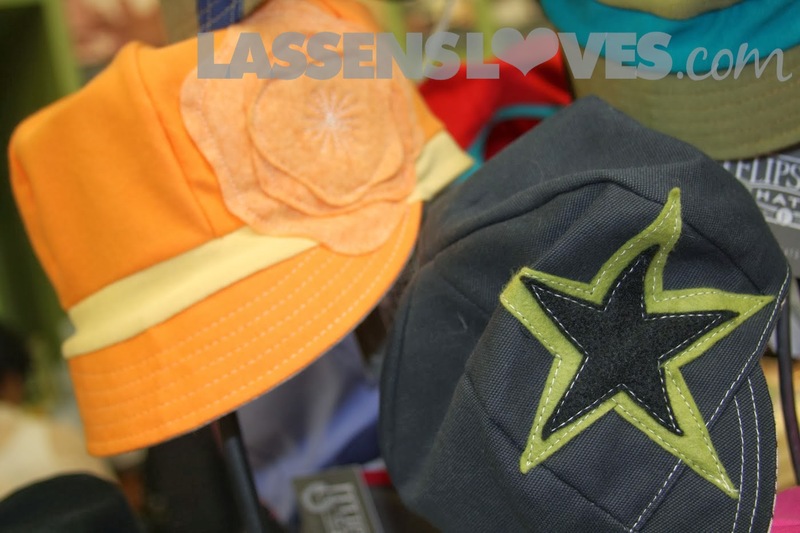 These great hats are just in our Ventura and Los Feliz stores right now. So cute! I totally agreed with her next recommendation–a “Winning Combination.” You should try this! 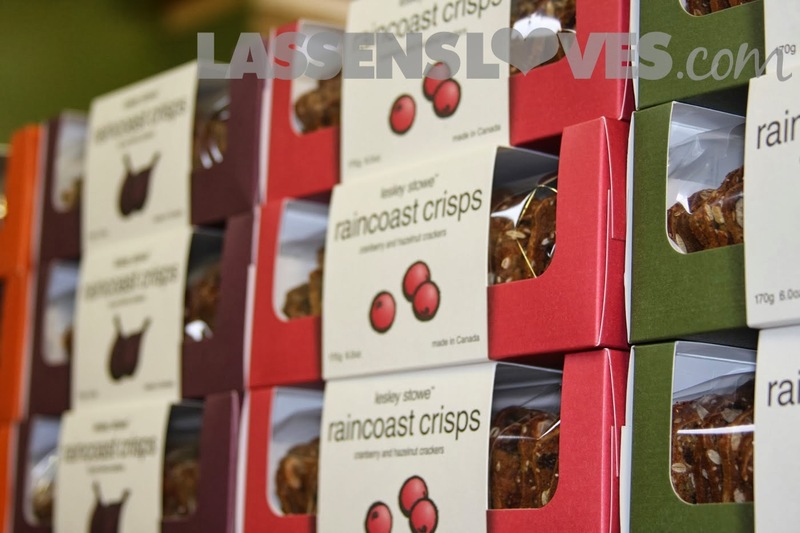 Get some Leslie Stowe Raincoast Crisps. 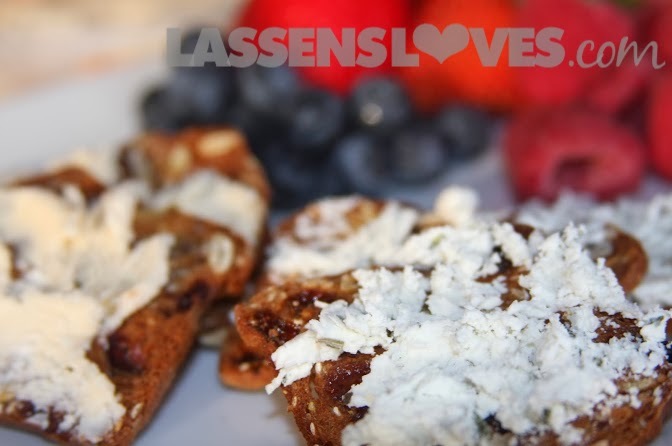 They are small, thick, tasty, crispy breads in amazing flavors (Cranberry and Hazelnut, Rosemary, Salty Date and Almond, Gluten-free Oat, to name a few!) I love that they are fancy and so delicious. They make me feel like a gourmet when I eat them! Take a crisp and then spread on some Drake Family Farms fresh Chèvre cheese. The Drake family farm is a six-generation operation! The original farm is in Utah, but they also have a farm in Ontario, California where we get our fresh Chèvre. The cheese comes in a convenient plastic tub so you can have some now and save some for later! This is Megan’s favorite combination! Yum! 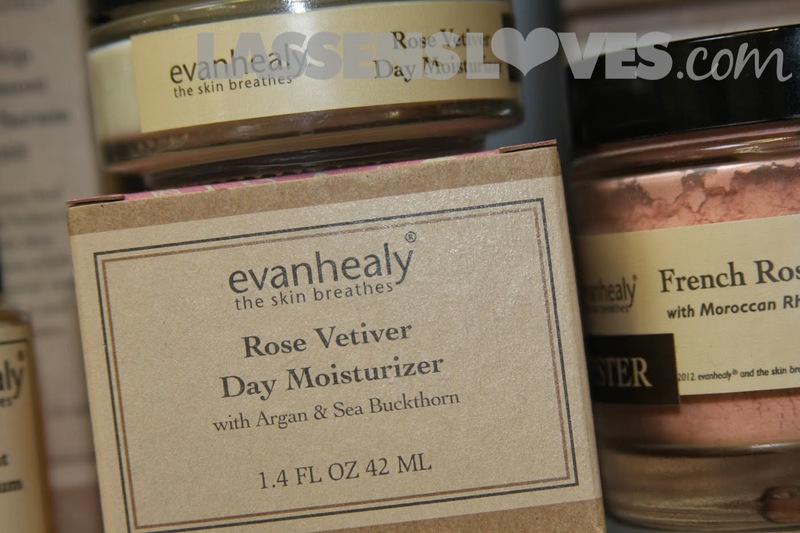 Megan also recommended the Evanhealy facial care line. 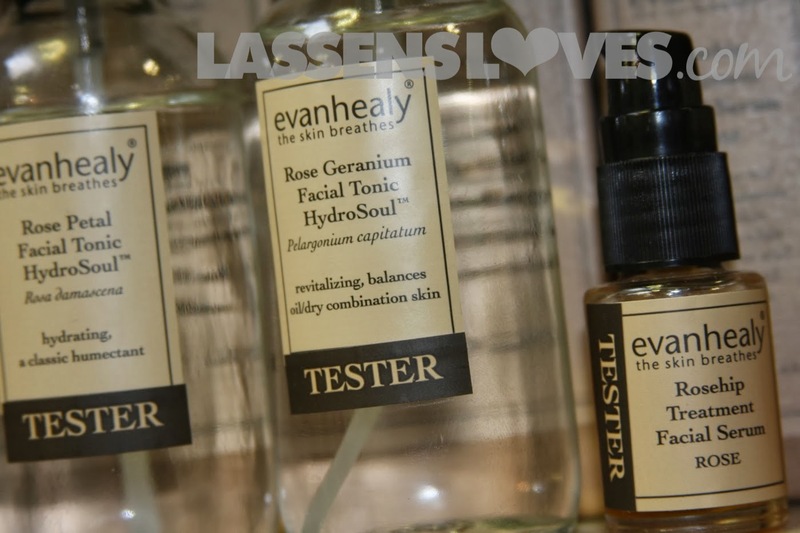 Her favorites are the Rose Geranium Facial Tonic HydroSoul, and the Rose Vetiver Day Moisturizer. And Very Sunny. So Apply Some Sunscreen! But What Kind? And are There Things I Should Avoid? Questions, Questions, Questions! We all need to be alert consumers as we choose products today. And as I have done some research, I have found some common ingredients in many sunscreens that we probably should avoid. Oxybenzone. In lab tests this chemical (in large amounts) has been found to interact with hormones and there is possibly a cancer connection. Retinyl Palmitate. This comes from Vitamin A, which sounds positive, but it’s not. It was added to sunscreens to reduce the signs of aging in the skin, but apparently it reacts badly in the sun, and has the potential to case greater harm. Most sunscreens have removed it from their ingredients. Nano particles. Sounds impressive, right? People don’t generally want to have white sunscreen so the particles have been reduced in size so that they don’t have a white appearance. The problem, however, is those tiny particles may be more readily absorbed into the skin, rather than just staying on the top, which is where we want it to be to protect our skin. But the jury is still our about if those particles absorbed into the skin may do some harm. So it’s better to avoid nano particles. 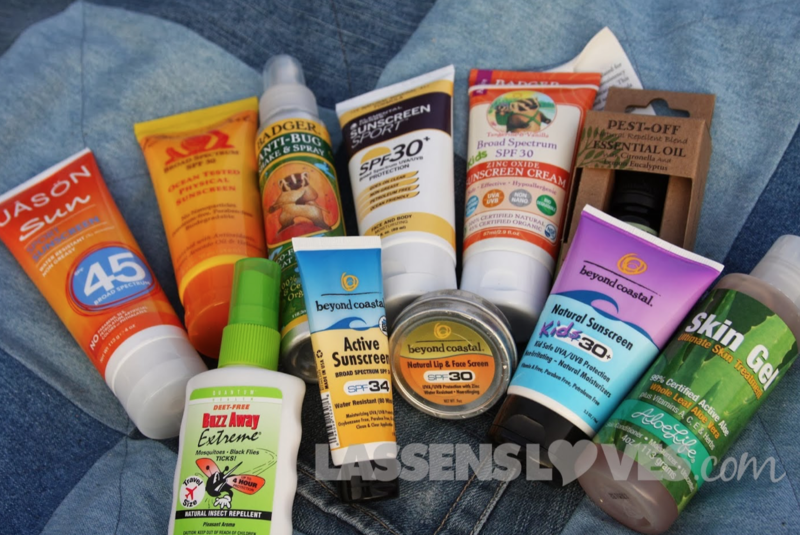 Sunscreen/Bug Repellent combos. Convenience, yes. But you’ll need to reapply the sunscreen often, and that will give you too much of the bug spray. And you’ll absorb more into your skin. Generally, bugs are not much of a problem in the day when you’re worried about the sun, and the sun is not a problem when it cools off and the bugs come out. So keep them separate. Spray sunscreens are convenient, but there is an inhalation risk. Sunscreen should stay on the skin, not in your lungs. Powdered sunscreens, for the same reasons. The FDA has removed the approval for loose powder sunscreens, but you may still see some on the market. Super high SPFs. The research indicates that anything over SPF 50 doesn’t provide much additional protection, and may give people a false sense of safety. Also, they may not have protection from the really dangerous UVA rays, which do their damage deep into the skin. Broad Spectrum protection. 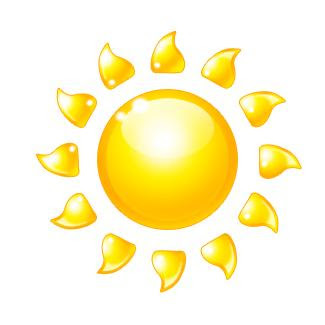 Make sure your sunscreen protects from both UVB and UBA rays. Look for “Broad Spectrum” or both UVA and UVB wording on the label. You’re going to have to reapply. Often. Get used to it. Bummer, right? But even the most water-resistant products will have to be reapplied after 40 or 80 minutes. Use clothing and shade to protect your skin. Here is a link to a website that gives your more information and recommendations about sunscreens. Remember that we are talking pesticides, here. Obviously we don’t want ticks burrowing into our skin, or mosquitoes sucking our blood, but spraying or spreading pesticides on the skin isn’t exactly appealing, either. There are some things you can do to cut back on your risk of bug bites, and then you don’t have to use as much of the repellents. 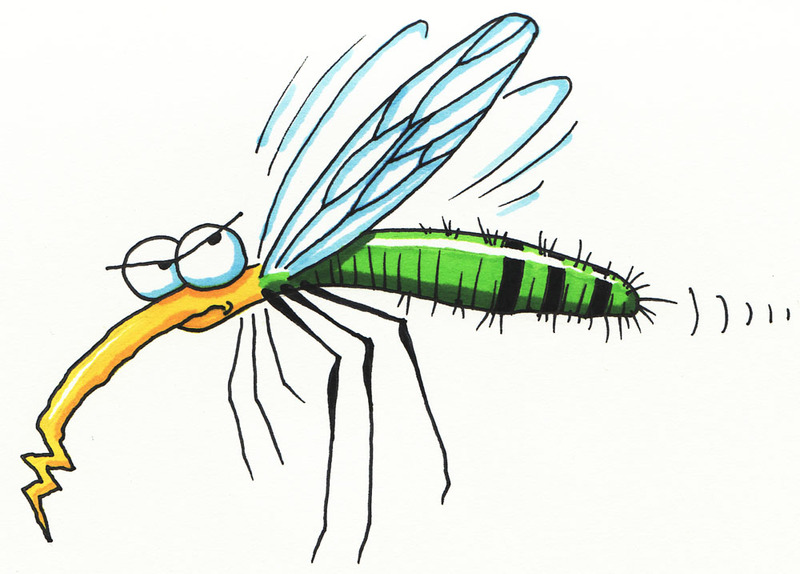 Something I just learned–insect repellents only protect agains biting insects, not ones that sting. So you’ll just have to avoid bees, wasps, and hornets. Long sleeves. Long pants, preferably ones that are tight at the ankles. Boring colors–you don’t want insects to think you’re a flower! No scented soaps, perfume, lotions, etc. Closed toed shoes and socks, especially in areas with ticks. You’ve probably heard of DEET. It is effective. Insects are attracted to the scent of carbon dioxide, which we give off; It’s part of breathing, so I don’t think we can avoid that! And DEET masks that scent. But there are other, more natural ways to keep the bugs away. The products we carry at Lassen’s generally use essential oils. Much nicer. Here is a website with recommendations and some other information. Lassen’s carries a large selection–and this photo shows just a small sampling–of natural sunscreens and insect repellents. Our helpful Body Care team members will be able to help you choose the ones that are right for you! And of course, just in case you still get too much sun, make sure to pick up some Aloe Vera gel to cool down and soothe your skin! Have lots of fun in the sun, but don’t forget to protect your skin! Does it ever feel like once you’ve established that you’re smack-dab in the middle of a dreaded Bad-Hair-Day that pretty much any activity that you’ve planned for the rest of the day is more or less doomed? Of course this can’t possibly be true; the smoothness, glossiness and comply-ability of one’s mane in no way has any physical or metaphysical force on the sequential moments on a person’s life. Impossible as it may be, many of us put a lot of emphasis on our do’s. One of the larger obstacles in the quest for the perfect coif is the idea of keeping it all natural and organic. Considering the amount of chemical agents that eerily slither into your system through your scalp and pores, all-natural beauty and cosmetic products seem like a no-brainer. Making the switch, however, can sometimes be a little more cumbersome than you’re ready for at the moment. That’s not to say that natural products don’t work as well, because that’s simply not true. Think of it as figuring out what tastes you like. I may swear up and down that ginger is one of the best tastes in the world but when my friend takes a sip of my ginger-mate she practically spits it in my face. Does that mean I’m wrong? No way! Ginger rules! Her taste buds just reject it with a fiery fervor (besides, she’ll learn to love it someday. Mark my words!). The same goes for cosmetic items. Like your taste buds, your hair and skin are just more indicators of what your body likes and needs (although spitting out a vile tasting beverage is hardly as fun as developing a rash). Think about a time when you had to choose between the commercial shampoo options; normal, dry or oily. Do you really think you’re dry hair is the same as every other person with dry hair? You can try to jump from brand to brand, but those long and menacing words printed on the back of the packaging show up on every single bottle. Your best bet is to look for formulas where you can identify (and hopefully pronounce) the ingredients. Ingredients like shea butter, orange flower oil, wheatgrass, and roobios. I know that all of the words mean and what’s more, I can visualize them. It’s taking the time to experiment, much like you would with food, to find out what your body naturally craves. But where to start? Where indeed! 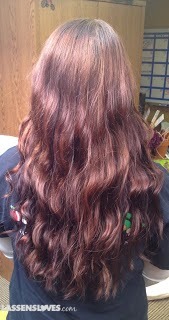 Our Lassens Marketing Director, Erin, has beautiful hair. I’m very serious. I turn into a sophomoric, jealous little girl when she unfurls her luscious locks (this probably stemming from years of repressed bad hair day anxiety). Finally, after months of biting my tongue and pulling on my flat, wimpy strands, I asked for her secret. Erin told me about Innersense Organic Beauty products. 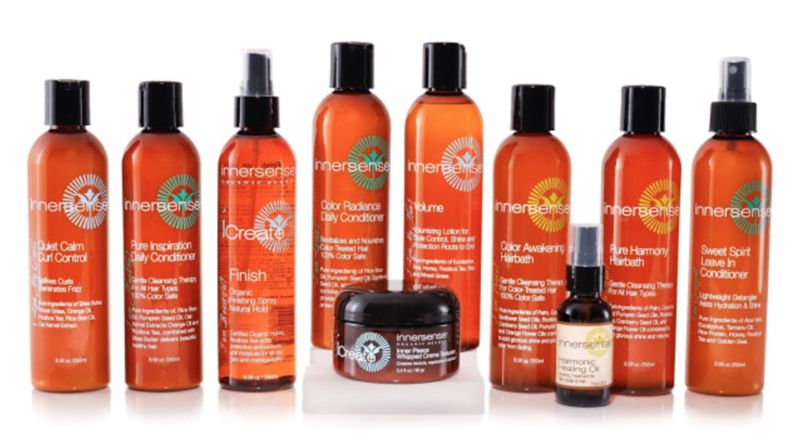 Innersense is a Certified Green Company and a Compact Signor of both Safe Cosmetics and Truth in Labeling Acts. They use certified organic and biodynamic oils, extracts and essences to keep hair nourished and hydrated. Erin raved on about their shampoos and conditioners; how they lather, how they smell and keep her hair soft and tangle free. Just when I thought that I had found her out, she let me in on her REAL secret weapon; Sweet Spirit: Innersence’s leave-in conditioner formula that adds body and manageability to just-washed hair without leaving it greasy or oily (that’s a huge one!). Erin uses is liberally. The girl basically head-bangs into a misty cloud of orange blossom and honey elixir. The smell is so delicious that sometimes she just sprays it to bask in the scent. True story! 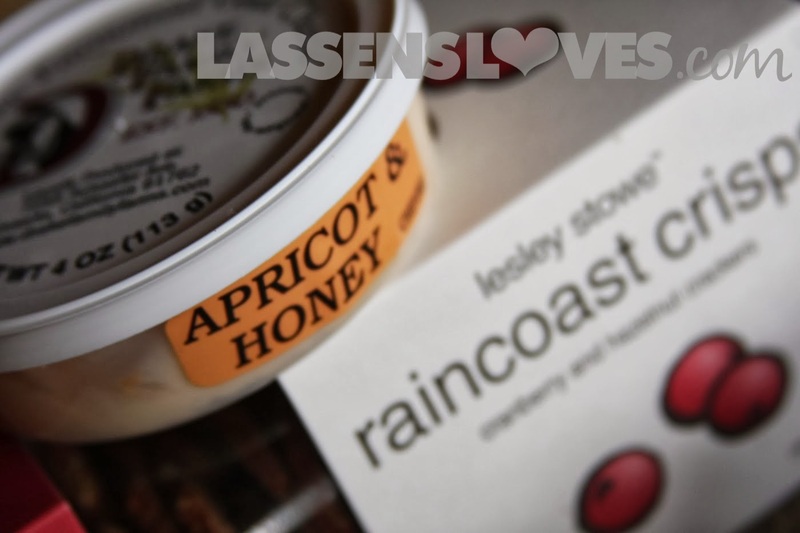 Lassens Loves: What made you want to create an organic hair care line? Greg Starkman: Joanne (my wife) and I have spent our careers in the beauty industry creating products. We were amazed at the number of brands that laid claim to being natural or organic yet those vary products contained synthetic and petrochemical compounds. As marketers we realized the emerging organic trends and the growing consumers demand for pure safe cosmetics, so we left the big jobs and made a commitment to creating products crafted from a rich combination of carefully selected Certified Organic and Biodynamic plant extracts, free of all synthetic & petrochemical compounds. Behold Innersense Organic Beauty was born! LL: How did you choose the ingredients for your formulas? What is your favorite product in the line? GS: That is a hard question, Harmonic Healing Oil, because of the healing benefits to the scalp, skin and hair. Quiet Calm Curl Control, because it makes my daughters curly hair beautiful. And lets not forget Sweet Spirit Leave in. OK all of our products are my favorite. Personally my hair is more on the oily side but is also very thin. What would you recommend? GS: Pure Harmony Hairbath and Pure Inspiration Daily conditioner. Pure Harmony is gentle enough not to pull all the natural oils from your scalp but create a balance. Daily conditioner at the ends for hydration. Because innersense is free of synthetic resins, or plasticizers there will be no build up on the hair. Are there any new items in the works that you can mention? GS: We are working on body and skin care for the future and hope to add some new styling products in the fall. Let us know what you think about this line in our comments or on our Facebook or Twitter page. Here’s wishing you a successful jump into the world of organic beauty care! She could be the woman who brought you into this world. She could be the woman who raised you, fed you, clothed you. She could be a trusted friend, confidante or mentor. or the one who you ran to when the world seemed scary. she’s right there with you every time you do a good deed and show kindness to another. Whoever Mother is to you, Sunday, May 13th is HER DAY! writing a silly poem using the letters in the word “MOTHER”, gluing noodles to a sheet of construction paper in the shape a flower or frosting cupcakes with hot pink (and practically inedible) sugar paste. As I’ve grown up all of the drawings, poems & baking atrocities that my Mom treasured have been replaced by neat, clean and paid for flowers and chocolates (which, given the past, I’m sure she appreciates). However, I know that there’s something about the handmade gift that touches a parent’s heart more than anything money can buy. 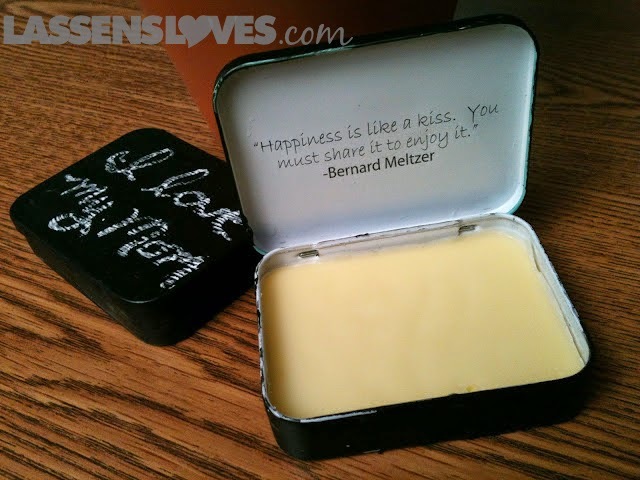 This Mother’s Day I’d like to share a recipe for a solid perfume using beeswax and essential oils. Until recently, I hadn’t ever heard of solid perfume. I found that it has its roots in Egyptian history as a scented balm that is rubbed on the skin using fingers or (in modern times) a cotton swab. It has since been modified and and redesigned to be more compact and portable. I like this idea for a Mother’s Day gift because it allows for you to be very specific to your Mom’s taste. You can make a custom fragrance based on smells that you know she likes or ones that remind you of her. For instance, I’m going to make my mom a rose perfume because of a memory that I have as a child of my mom growing roses in the backyard. • 12- 16 drops Aura Cacia organic essential oil fragrance of choice. (Note: In these images I tripled the recipe to fill 2 larger candy containers. The recipe as follows make about 2 Tablespoons worth of perfume. 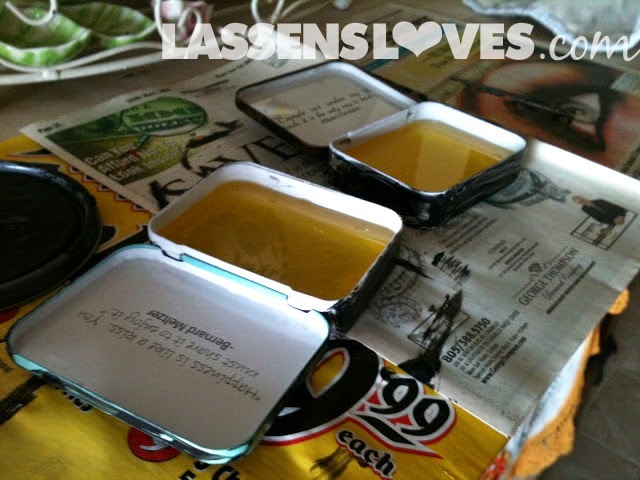 Pour beeswax into glass jar. 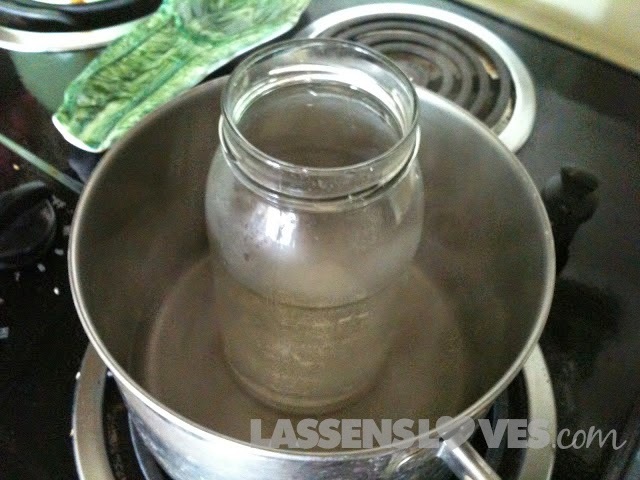 Place glass jar in small pot. 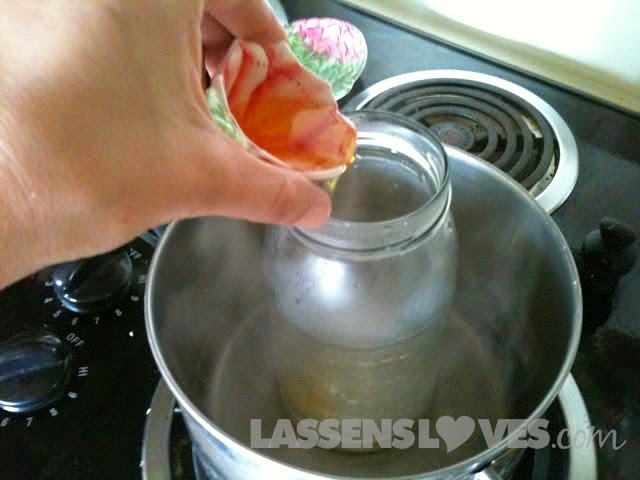 Fill pot with 2-3 inches of boiling water and on stove top on low. add essential oils and jojoba oil. 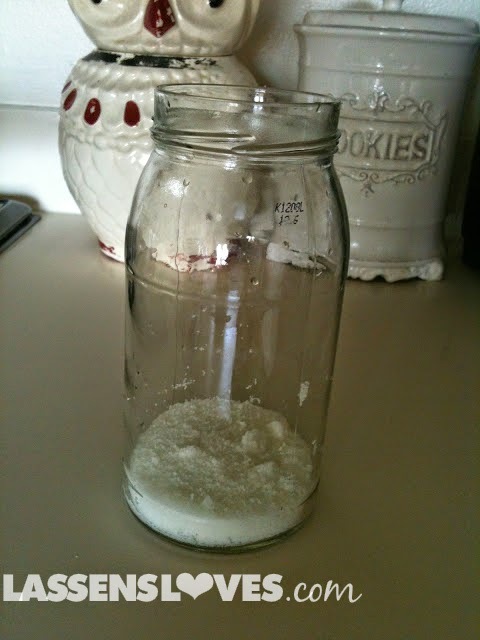 Pour mixture into decorative container and let cool. Find an antique perfume locket at a thrift store or online and fill it with the perfume. 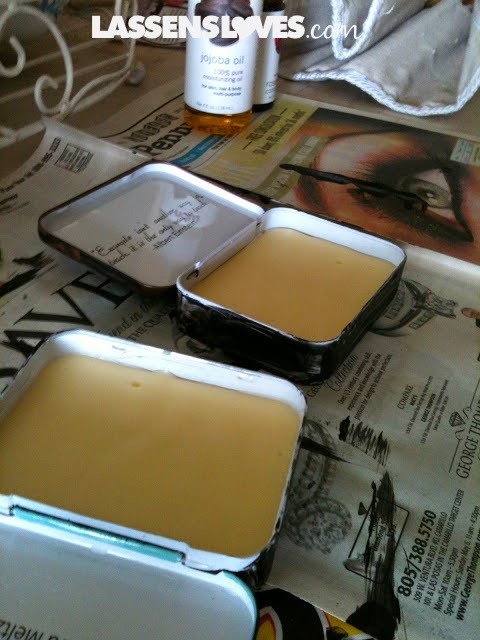 For a personal touch, pour mixture into and old mint or candy tin. 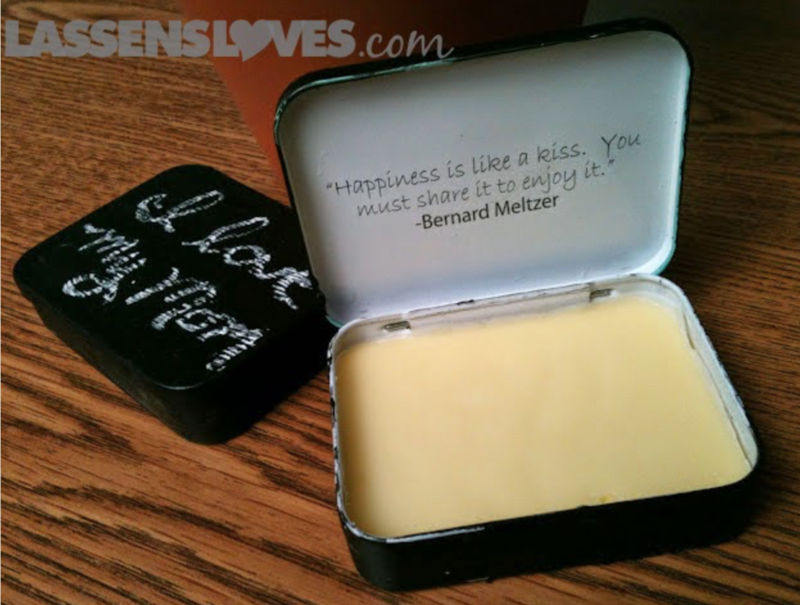 I used 2 old Xyla mint tins that happened to already have beautiful quotes on the inside lid. 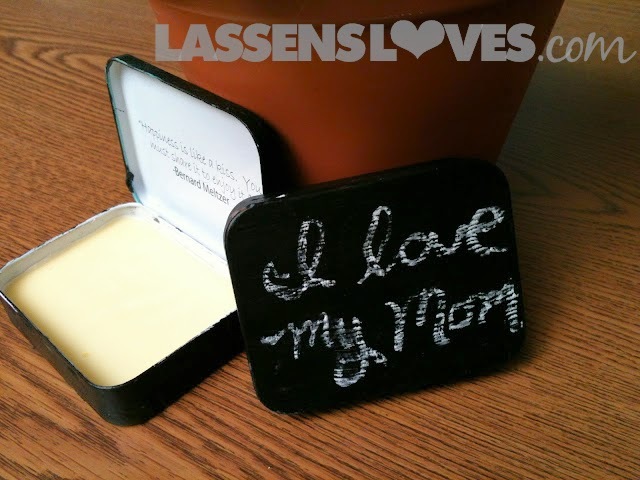 Paint the outside with chalk paint (this will take a few layers of paint) and write a special message to Mom! Pair your solid perfume with a complementary organic chocolate bar and flowers (after-all, I’m sure she still loves your grown-up gifts). 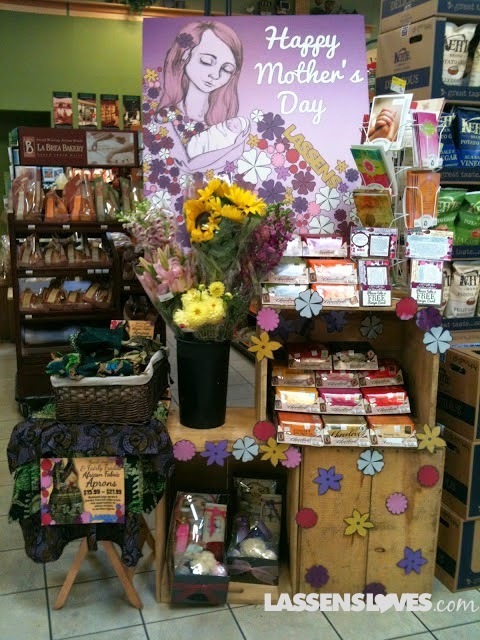 For more ideas, visit our Mother’s Day display at your local Lassens Natural Foods & Vitamins for great deals on organic chocolates, bouquets of local flowers, environmentally friendly Mother’s Day cards, fair trade handmade aprons and jewelry! You can also pick up this and other recipes as free recipe cards on the display. 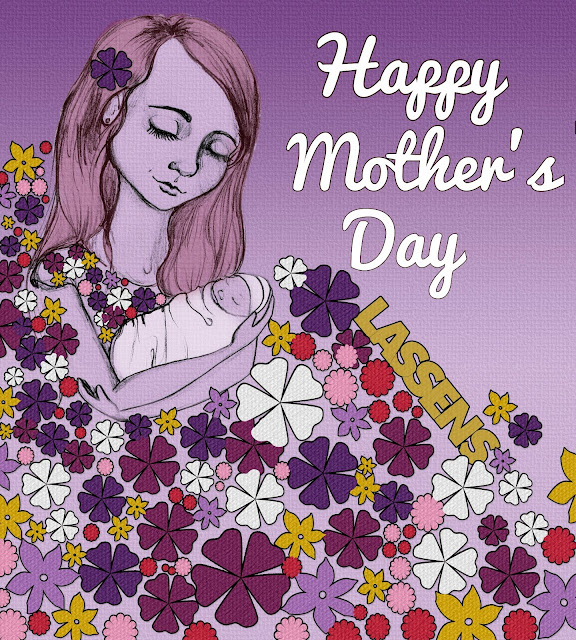 Wishing everyone a very special Mother’s Day with the people you love!